of all shopping searches on Google happen between the hours of 10 p.m. and 4 a.m.1 That’s because shopping doesn’t stop once the mall closes. Today’s shopper spends more time than ever researching purchases online at all hours of the day; we’ve gone from midnight snacking to midnight shopping. To understand how digital trends will impact this year’s shopping season, we conducted our annual Holiday Shopper Intentions research with Ipsos MediaCT, surveying consumers on their shopping behavior. We found that people are shopping earlier, using online video to help with research, and turning to smartphones as personal shopping assistants. Shoppers are also spending more time consulting more sources before making a decision. In 2010, shoppers used five sources of information on average before purchasing, but that has more than doubled with shoppers consulting at least 12 sources last year.3 This means that October through November has become a crucial period for retailers to reach shoppers online, being present with offers, information, how-tos and content. Shoppers are going online for inspiration at all points of their day, not just to research specific products but to see what their friends and favorite influencers are wearing. Sites like YouTube and Pinterest have become the new window displays, and a new generation of fashion influencers like Bethany Mota are influencing shopping decisions. We’ve found that when retailers understand mobile behavior in stores, they can meet shoppers online with helpful information. In fact, 46% of shoppers who use their phone in a store still end up making a purchase, an 11 point increase from 2011.8 Consumers are coming into stores more purposeful and informed than before, and savvy retailers are turning this into an opportunity. Want to know more about the 2014 holiday shopper? 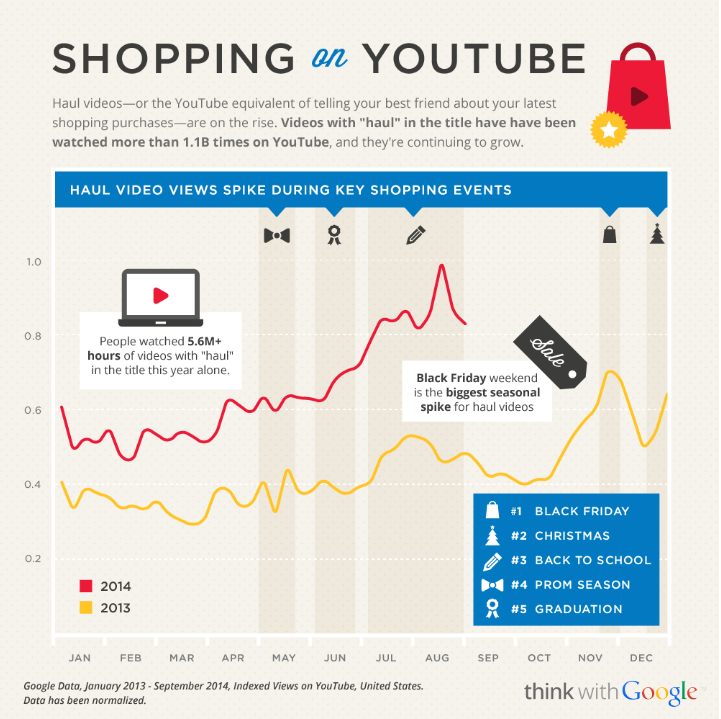 Check out more research and case studies at Think with Google. This holiday shopping season will be our most connected ever, with devices at our fingertips helping us hunt for deals in short moments—whether it’s on a laptop at work or on a smartphone right before bed. 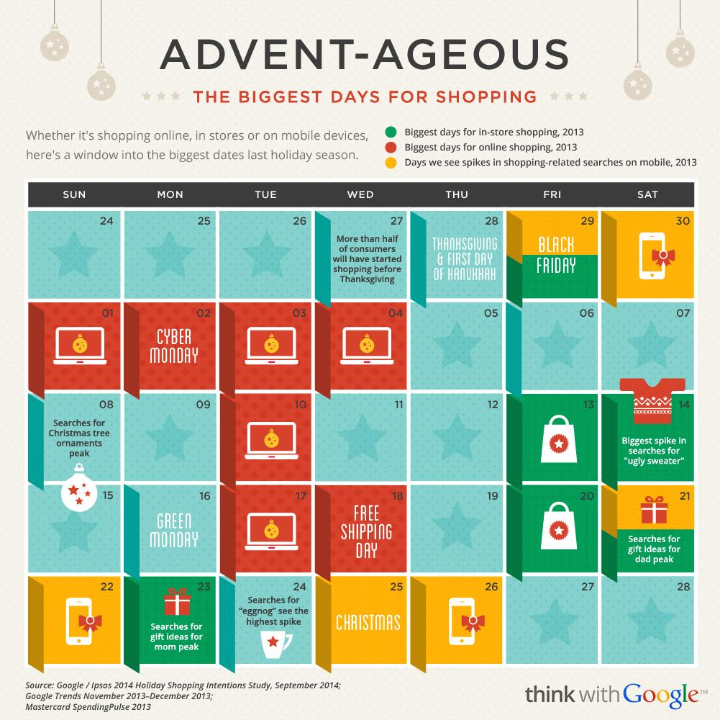 In fact, one third of all shopping searches on Google happen between the hours of 10 p.m. and 4 a.m.1 That’s because shopping doesn’t stop once the mall closes. Today’s shopper spends more time than ever researching purchases online at all hours of the day; we’ve gone from midnight snacking to midnight shopping.